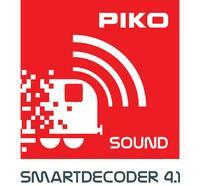 PIKO sound locomotives are factory-fitted with a modern PIKO sound decoder with more than 21 switchable functions. All loco-typical sounds like engine and driving noise, signal horns, brake squeals, track and curve noises as well as a variety of station announcements can separately be activated. The multiprotocol decoders support mfx® and RailCom®. Engine sounds can also be retrieved during analog operation. ~Sound BR 412 4tlg. ICE 4 DB AG VI + PluX20 Dec.